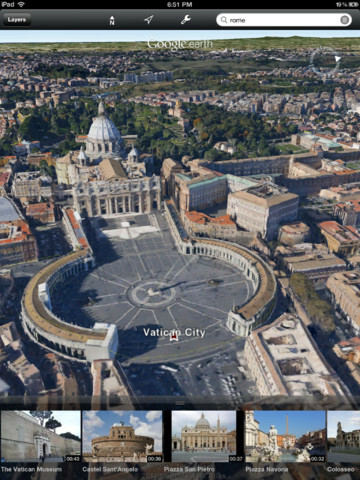 Google Earth for iOS has been updated to add 5 3D cities including Los Angeles, Boston, San Francisco, Geneva and Rome, bringing it on par with the release for Android devices last month. This release also includes the ‘tour guide’ feature that takes you on a trip through the historic locations and landmarks of those cities. The features are only available on the iPhone 4S, iPad 2 and new iPad, presumably due to graphics processing requirements that are too stringent for older devices. Google touted the new 3D imagery during an event early last month. Notably, the 3D features were demonstrated on an iPad, not an Android tablet. Nevertheless, the new imagery came to Android first. Apple, of course, announced its very own Maps app with 3D imaging built right in shortly thereafter at its WWDC conference. Google has yet to include the 3D data into its own mapping apps on Android outside of the standalone Google Earth, although it seems inevitable.